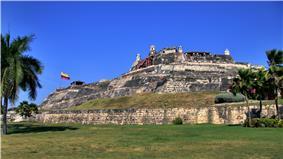 Castillo San Felipe de Barajas in Cartagena de Indias, Colombia, an example of a Early Modern coastal defense. Coastal defence (Commonwealth and Ireland) or coastal defense (US) and coastal fortification are measures taken to provide protection against attack by military and naval forces at or near the shoreline. Because an invading enemy normally required a port or harbour to sustain operations, such defences are usually concentrated around such facilities, or places where such facilities could be constructed. Although most coastal fortifications are on the coast, not all are. Instead, some are off the coast on islands, artificial islands, or are specially built structures. All the sea forts share the characteristic that at least at high tide they are completely surrounded by water. Some, such as Fort Denison or Fort Sumter, are actually in harbours, but most are off the coast. Again, some, such as for example Bréhon Tower, completely occupy small islands, although others, such as for example Flakfortet and Pampus, are on artificial islands built up on shoals. Fort Louvois is on a built-up island, 400 meters from the shore, and connected to it by a causeway that high tide completely submerses. The most elaborate sea fort is Murud-Janjira, which is so extensive that one might truly call it a sea fortress. The most recent sea forts were the Maunsell Forts, which the British built during World War II. One type consisted of a concrete pontoon barge on which stood two cylindrical towers on top of which was the gun platform mounting. They were laid down in dry dock and assembled as complete units. They were then fitted out before being towed out and sunk onto their sand bank positions in 1942. The other type consisted of seven interconnected steel platforms built on stilts. Five platforms carried guns arranged in a semicircle around the sixth platform, which contained the control centre and accommodation. The seventh platform, set further out than the gun towers, was the searchlight tower. Cannons of the Valdivian Fort System in Niebla, Chile, an example of a coastal defense. In Colonial times the Spanish Empire diverted significant resources to fortify the Chilean coast as consequence of Dutch and English raids. The Dutch occupation of Valdivia in 1643 caused great alarm among Spanish authorities and triggered the construction of the Valdivian Fort System that begun in 1645. View looking north from the gun platform. Taku Forts Museum, China. China first established formal coastal defences during the early Ming dynasty (14th century) to protect against attacks by pirates (wokou). Coastal defences were maintained through both the Ming dynasty and the Qing dynasty that followed, protecting the coast against pirates, and against the Portuguese and other European powers that sought to impose their will on China. Subsequently, the European powers built their own coastal defences to protect the various colonial enclaves that they established along the Chinese coast. One such, a fort built by the British commanding the Lei Yue Mun channel between Hong Kong Island and the mainland, has been converted into the Hong Kong Museum of Coastal Defence. This tells the story of coastal defence along the South China coast from the Ming dynasty onwards. Saint Mary's Tower, which was built in 1618, is still in use by the Armed Forces of Malta. The islands of Malta, Gozo and Comino all have some form of coastal fortification. The area around the Grand Harbour was fortified around the time the Arabs occupied the Maltese islands, and a fortress known as the Castrum Maris was built in Birgu by the 13th century to protect the harbour. 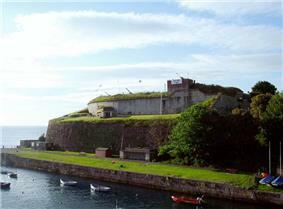 The fortifications around the harbour area were rebuilt by the Order of Saint John between the 1530s and the 1550s, and the Castrum Maris was renamed Fort Saint Angelo. Additionally, Fort Saint Elmo and Fort Saint Michael were built, and walls surrounded the coastal cities of Birgu and Senglea. In 1565, the Great Siege of Malta reduced many of these coastal fortifications to rubble, and after the siege they were rebuilt. The fortified city of Valletta was built on the Sciberras Peninsula, and further modifications were made to the fortifications over the years. The harbour area was strengthened even more by the building of Fort Ricasoli in the 17th century and Fort Manoel and Fort Tigné in the nearby Marsamxett Harbour in the 18th century. Despite this, the rest of the islands remained largely undefended up to the 17th century. From 1605 onwards, towers such as the Wignacourt towers, Lascaris towers and the De Redin towers as well as several batteries and redoubts were built. Between 1605 and 1720, a total of 32 towers were built, and 23 of them survive to this day (and 2 more still exist in ruins). One of the intact towers, St Mary's Tower on Comino is still in use as a lookout against contraband and illegal hunting by the Armed Forces of Malta. Further fortifications were built by also the British in the 19th and 20th centuries, such as Fort Rinella which houses the 100-ton gun. BL 8-inch Armstrong disappearing gun at North Head, New Zealand. The coastline of New Zealand was fortified in two main waves. The first wave occurred around 1885 and was a response to fears of an attack by Russia. The second wave occurred during World War II and was due to fears of invasion by the Japanese. The fortifications were built from British designs adapted to New Zealand conditions. These installations typically included gun emplacements, pill boxes, fire command or observation posts, camouflage strategies, underground bunkers, sometimes with interconnected tunnels, containing magazines, supply and plotting rooms and protected engine rooms supplying power to the gun turrets and searchlights. Taiwan has several coastal fortifications, with some, such as Fort Zeelandia or Anping Castle dating to the time of the Dutch East India Company. 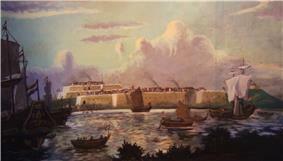 Others, such as Cihou Fort, Eternal Golden Castle, Hobe Fort, date more to the end of the 19th Century. The Uhrshawan Battery dates primarily to the first-half of the 19th Century. It actually underwent bombardment during the Sino-French War. Fort McHenry in Baltimore harbor, USA, typifies an early seacoast defense system prior to the War of 1812, with low earthworks. The cannons are Civil War era. The defence of its coasts was a major concern for the United States from its independence. Prior to the American Revolution many coastal fortifications already dotted the Atlantic coast, as protection from pirate raids and foreign incursions. The Revolution led to the construction of many additional fortifications, mostly comprising simple earthworks erected to meet specific threats. The prospect of war with European powers in the 1790s led to a national programme of fortification building spanning seventy years in three phases, known as the First, Second and Third Systems. By the time of the American Civil War, advances in armour and weapons had made masonry forts obsolete, and the combatants discovered that their steamships and ironclad warships could penetrate Third System defences with acceptable losses. In 1885 US President Grover Cleveland appointed the Endicott Board, whose recommendations would lead to a large-scale modernization programme of harbour and coastal defences in the United States, especially the construction of well dispersed, open topped reinforced concrete emplacements protected by sloped earthworks. 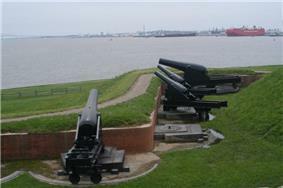 Many of these featured disappearing guns, which sat protected behind the walls, but could be raised to fire. Mine fields were a critical component of the defence, and smaller guns were also employed to protect the mine fields from minesweeping vessels. The development of military aviation rendered these open topped emplacements vulnerable to air attack. Therefore, the next, and last, generation of coastal artillery was mounted under thick concrete shields covered with vegetation to make them virtually invisible from above. In anticipation of a conflict with Japan, most of the limited funds available between 1933 and 1938 were spent on the Pacific coast. In 1939 the threat of war in Europe prompted larger appropriations and the resumption of work along the Atlantic coast. 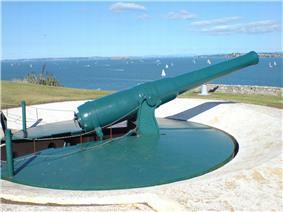 Nothe Fort is situated beside Weymouth Harbour, UK. ^ a b c d e "Coastal Defense". GlobalSecurity.org. Retrieved 2009-11-29. ^ a b c "Gallery 2: The Ming Period (1368-1644)". Hong Kong Museum of Coastal Defence. Retrieved 2009-11-29. ^ a b Baigent, Captain AJ (1959). "Coast Artillery Defences". Royal New Zealand Artillery Association. Retrieved 2009-11-29. 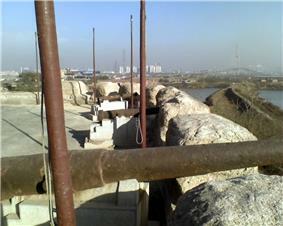 ^ "Coastal Defense". United States National Park Service. Retrieved 2009-11-29. ^ Brown, D. (2006). "Palmerston and Anglo--French Relations, 1846--1865". Diplomacy & Statecraft 17 (4): 675–692.